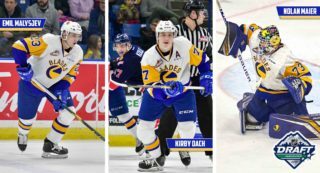 Calgary, Alta – Team Alberta and Team British Columbia punched tickets to the 2017 WHL Cup Final yesterday, scoring decisive victories in their respective semifinal matchups at the Markin MacPhail Centre. 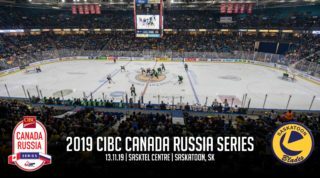 Playing Saskatchewan for the second time in as many days, British Columbia went one goal better in their semifinal rematch, solidifying their claim to a spot in the final with a 7-0 victory. Blades’ prospect Kalen Szeto scored his second goal of the tournament on the power play, B.C.’s fifth goal of the game. 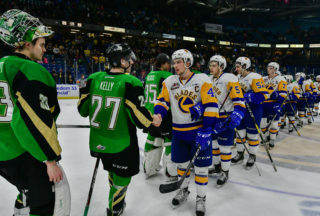 Alberta continued their winning ways in their semifinal, putting it beyond doubt they deserve to be in the gold-medal match too, with a 7-1 drubbing of Manitoba. Kyle Crnkovic continued his excellent tournament form with two goals and an assist, enough to earn first star honours for the match. As a result, Crnkovic stayed atop the point leaders table with 10 from 4 games played. Alberta and B.C. will face off in the tournament finale Sunday at 1:30 pm Mountain Time. 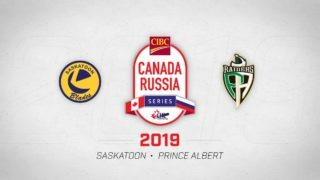 Meanwhile, the bronze-medal match features a “Battle of the Prairies” rematch between Manitoba and Saskatchewan, which begins at 9:30 am Mountain Time. The latter of these two matches is already underway at the time of publishing this report. 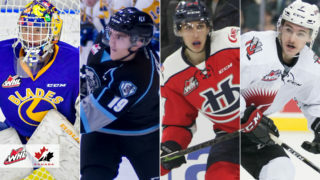 Kyle Crnkovic of Alberta and Aiden De La Gorgendiere, Kalen Szeto and Koen MacInnes of British Columbia will play in the gold-medal matchup while Kyle Lamoureux of Manitoba and Alex Ozar and Anthony Toporowski of Saskatchewan will represent in the bronze-medal match.